With a warm fire in the background, plates were piled high with turkey, gravy, dressing, and cranberry sauce. Stories of finishing a big project and landing a coveted internship were mixed in with singing, laughter, and recipe requests. A dog scurried — expectantly — from table to table, pausing for head rubs and “dropped” dinner rolls. This was the scene at Massey House, the president’s residence, on the afternoon of Wednesday, November 21, when President Jo Allen, ’80, and members of Meredith’s residence life and international programs staffs hosted a Thanksgiving feast for students staying on campus for the holiday break. “Today — the day before Thanksgiving — is my very favorite day of the year. I am grateful I get to spend this time with you.” Allen said, as she, and her dog, Bachelor, welcomed students from China, Kenya, Afghanistan, and other far away places. Allen began celebrating Thanksgiving with international and out-of-state students about five years ago. She and Jean Jackson, ’75, vice president for college programs, had the idea to begin this new tradition after the departure of an enrollment employee who often hosted international students at his house during Thanksgiving. “I’ve been proud to host the event for the past several years and always enjoy time with this special population of students whose love for Meredith lends a very different but altogether reaffirming sense of our strengths,” said Allen. The students seemed equally excited to spend the afternoon with the woman who heads their college, as they posed for selfies with the president, and shared stories of their Meredith experiences. 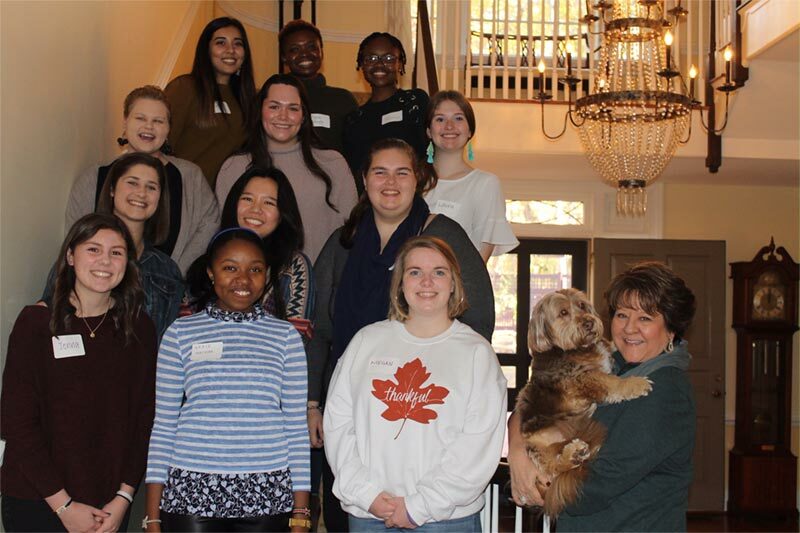 “Students are grateful to have a president in Dr. Jo Allen, who welcomes them into her home and who takes a personal interest in their well-being throughout their time at Meredith,” said Jackson. Kezia Wafula, ’21, who came to Meredith from Kenya, looks forward to the event. “I enjoy the food especially, the house is beautiful, and I like interacting with the president,” Wafula said. This year’s gathering also gave her the chance to finalize plans for a Friendsgiving over the weekend. Students meet on campus before the event to travel together through the Meredith forest to Massey House. Like most Thanksgiving celebrations, the food is plentiful and plays a big part in the memory making. The menu features a dish Allen’s mother always served for the holidays. Takeout containers are provided so the students can experience another Thanksgiving tradition — enjoying leftovers for days. And, while the feast plays a central role in the event, Jackson says breaking bread together serves a deeper purpose. “We come together for a meal but a meal that is much more than that—a meal that celebrates the Meredith family, gives students an opportunity to meet others who are staying on campus and to plan shared activities over the long Thanksgiving weekend,” said Jackson.